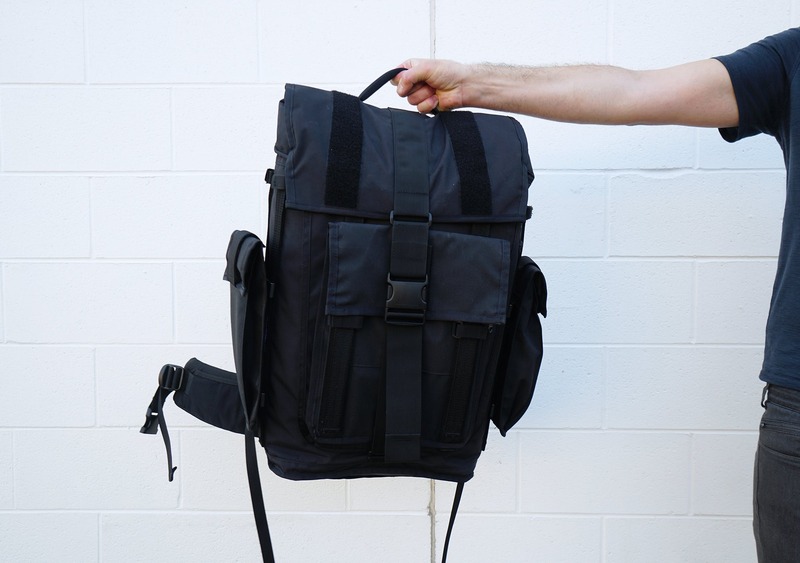 The Mission Workshop Radian is a bag enthusiasts dream. A highly customizable, unique travel pack with a proprietary accessory system, smart design, and unbelievable carry. The bad part? It’s heavy, bulky, and not ideal for air travel. 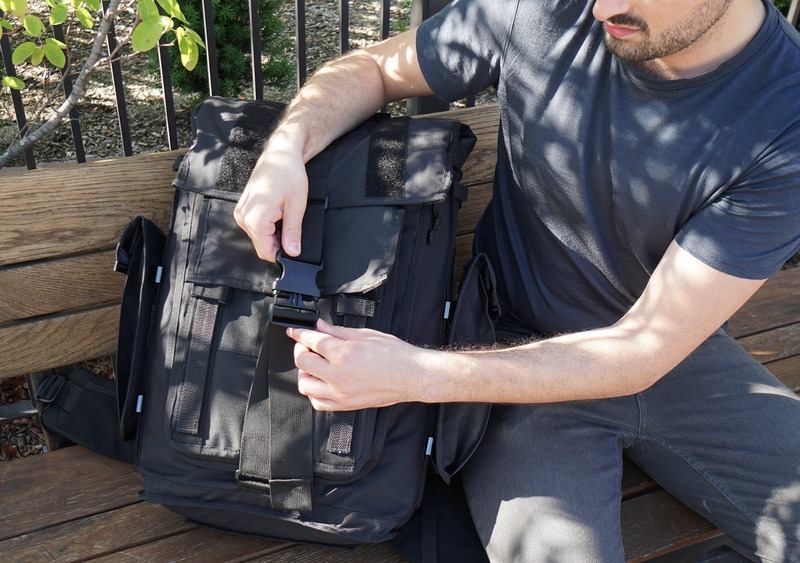 The Radian is a travel pack made by Mission Workshop, a company that creates premium products for travel—including packs, clothing, duffels, and a whole lot of other stuff. You could probably build out your entire travel kit with nothing but Mission Workshop gear if you were so inclined. We’ve tested a few other Mission Workshop products and we tend to like their unique aesthetic and smart features. One of those smart features, which you will see on this bag, is the ARKIV system. It’s kind of like their own proprietary MOLLE system. You can use it to attach various accessories to their bags and customize everything as you see fit, which adds a ton of functionality to all of their products. We will, of course, dive into all this and more in our review below. So let’s take a look. 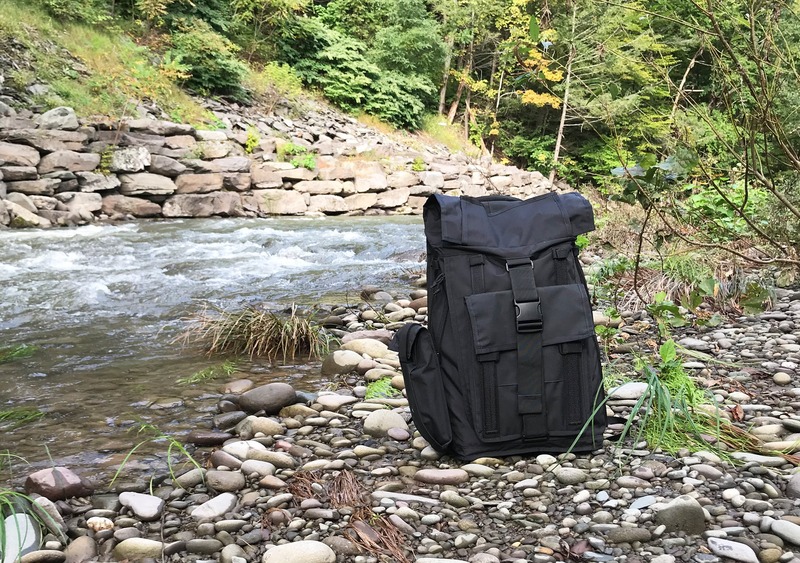 We’ve been testing this pack for over two weeks on trips to upstate New York, New York City, and Detroit. Within those two weeks, there is one thing that has made itself very clear: this bag doesn’t look like many other travel packs out there. It sort of looks like something a supervillain would wear. Now, we test a lot of backpacks. 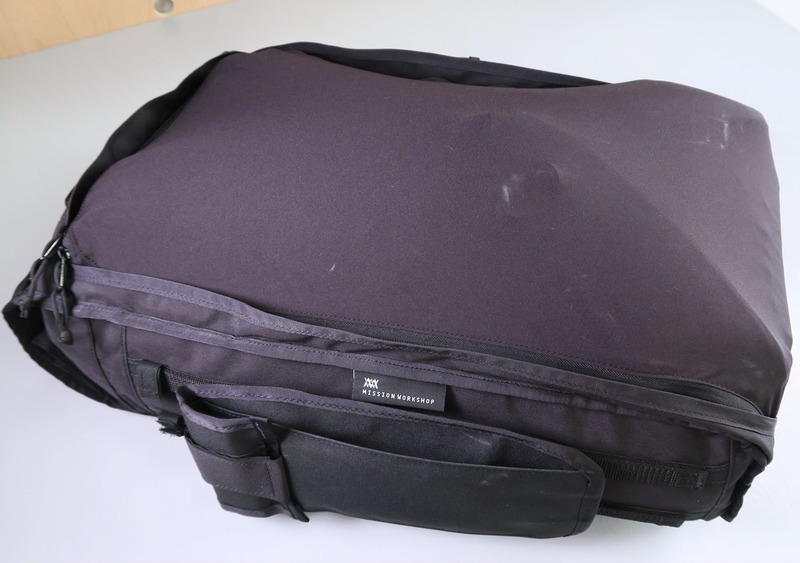 And we have to say that this is one of the widest bags we’ve ever tested. 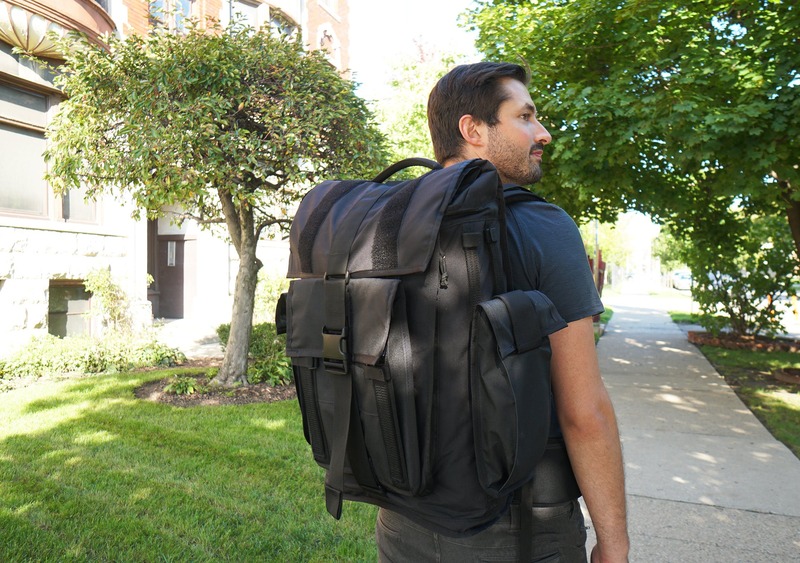 It does have a pretty slim profile, but it sticks out on the sides a bit more than most packs we’ve tested, especially if you have any of the ARKIV pockets on the side. Just a heads up, you might find yourself running into some doors or bumping into people in close quarters as you get used to this thing. But this wide build does make for a fantastic carry. 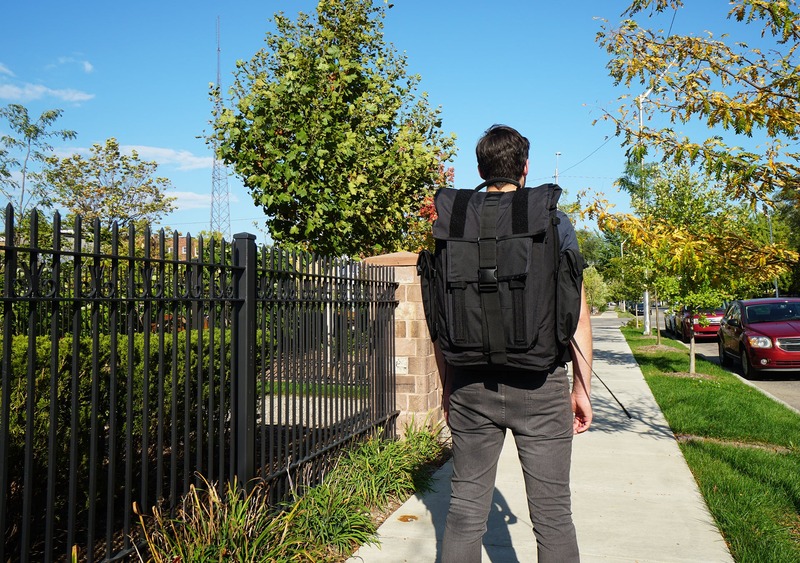 It distributes the weight really well across your back and when you couple this with the solid harness system, it means you can carry this pack for long periods of time with no issues. As far as branding goes, you can see one small logo tag on the side of the pack and there is one logo on the inside. At the time of this review, the Radian comes in gray, black, and a black camouflage. The gray and black versions have Mission Workshop’s HT500 nylon, which has a coating similar to waxed cotton canvas. The camo version is made with a 500D Multicam CORDURA® nylon. Both of these fabrics are highly durable and weatherproof fabrics, although we do find it a bit odd that they’re using different materials for different colors. Unless you’re extremely specific about what fabrics you want, you shouldn’t worry about this—just go with whichever color you like best. Each version does come with Mission Workshop’s floating liner, which is a highly weather resistant liner on the inside of the pack. It’s a totally waterproof material, so it will add a lot of weather resistance to the pack—but, of course, the huge gaps in the top loader mean this pack is by no means waterproof. But even in a decent downpour, your stuff should be mostly fine. All versions of the Radian use Duraflex plastic hardware, but you can get a metal COBRA™ buckle instead if that’s your style. We love metal hardware—and we really like this buckle in particular—but it does add a bit of additional weight and it’s not the most practical for air travel. That being said, it looks damn good, it’s very satisfying to clip, and it’s super durable. Now, all those durable materials come together to make a solid layout and design—which we love—but it definitely comes with a weight penalty. Which we don’t particularly love. 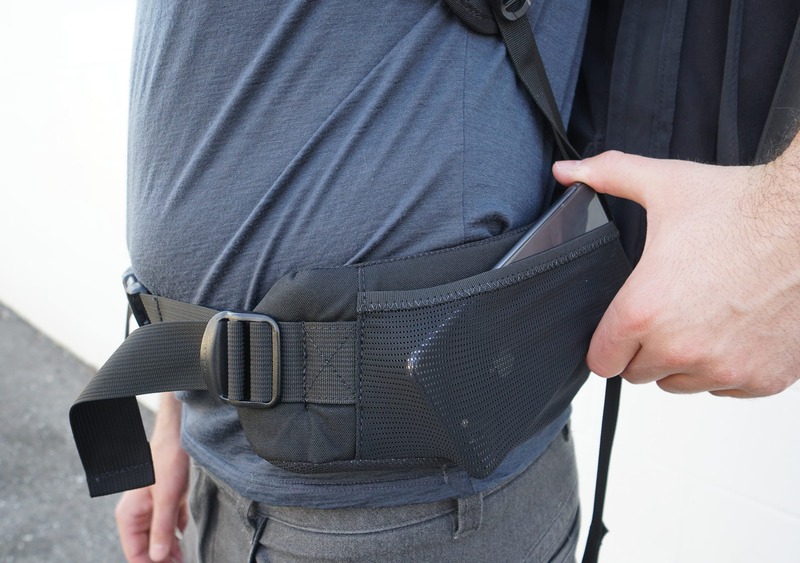 Without any of the ARKIV pockets on the outside, without the hip belt, and without that COBRA™ buckle, this thing comes in at a whopping 4.8 pounds. That’s 0.2 pounds heavier than the GORUCK GR3, which is a truly massive bag, and it’s over a pound heavier than the Aer Travel Pack 2. And that’s just the starting weight, without any of the accessories! If you’re looking for a lightweight travel pack, we’re not going to beat around the bush—this is not the pack for you. If you’re looking for a highly customizable, weatherproof bag with a unique look—this just might be the one. First on the list of external components is the harness system. 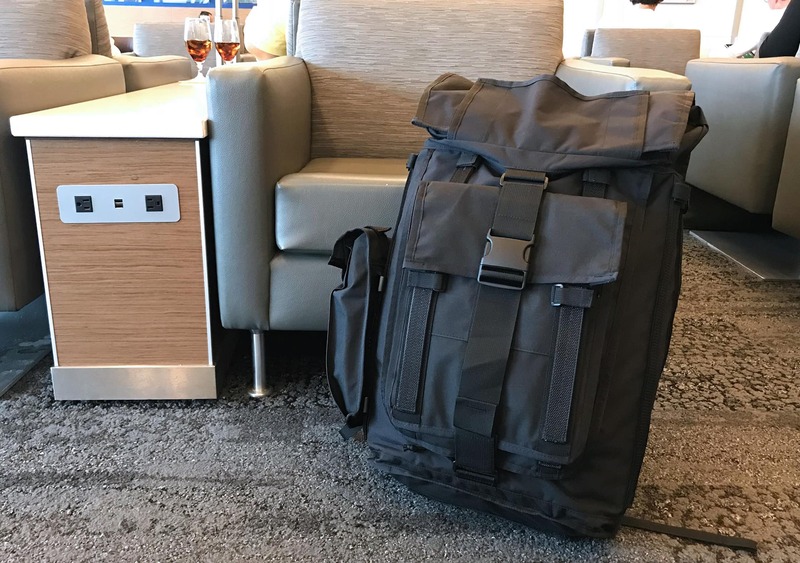 This is one of the most comfortable and adjustable systems we’ve seen in the travel backpack space. Yes, you read that right. It is one of the most comfortable and adjustable systems we’ve seen. Period. 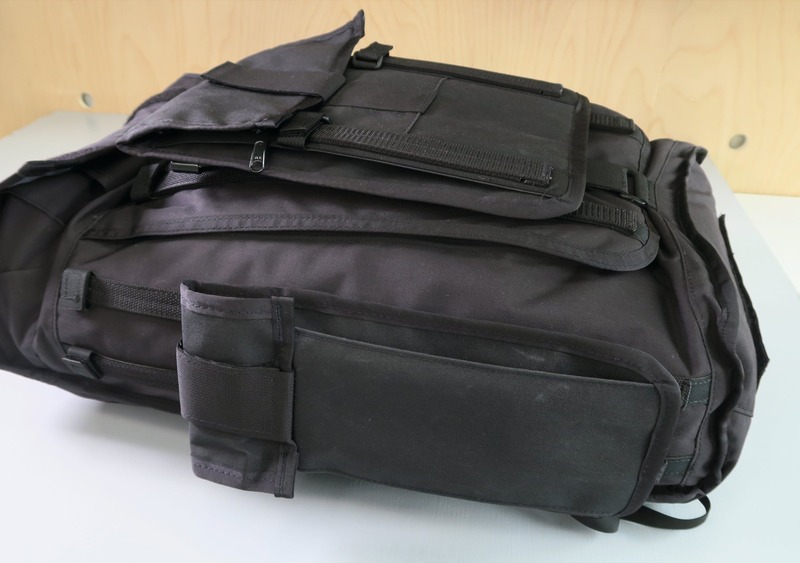 When it comes to balancing the load and creating a more comfortable carry for your individual body size, you have a ton of options and features to utilize with this pack. So much so that when we listed everything out in a paragraph it was a jumbled, confusing mess. So we decided to go with bullets. Here we go. 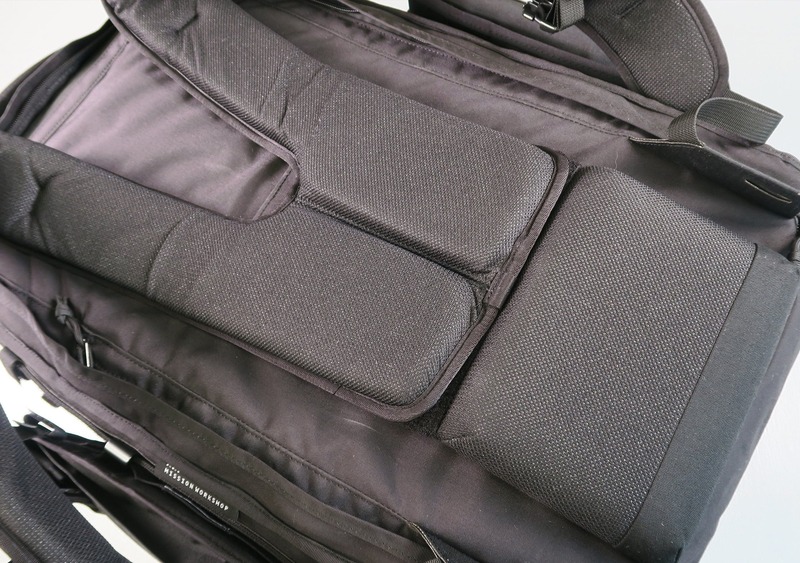 The straps are made with a soft, padded foam towards the top and a higher density foam near the bottom, which help to provide a comfortable carry. There are load lifters that can be used to adjust the way the bag sits on your back, pulling it closer and up a bit higher. There’s an adjustable, Velcro sternum strap that can be used on four different positions on the shoulder straps. There’s an aluminum frame on the back of the pack that gives it some structure and helps balance the weight of whatever you’re carrying. The back panel is well-padded and comfortable but also thin, which helps with airflow on the sides of your back. There is a detachable hip belt that is super beefy, called the “Expedition hip belt,” and it integrates seamlessly with the Radian. There are some stretchy pockets on the side of the hip belt that do not zip up—good for small items you want to toss in as needed, but not great for keeping things super secure. See?! There’s a lot going on. And we’re not even done yet. 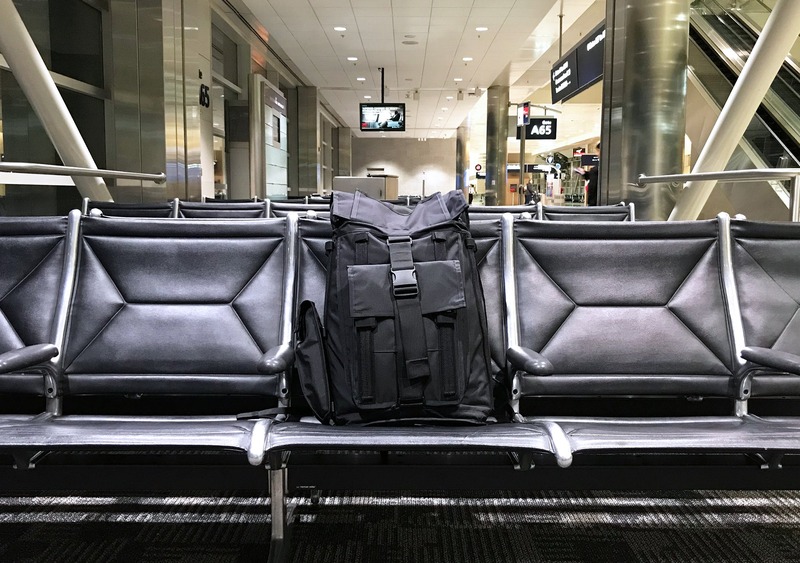 The whole harness system can zip up into itself to hide all those straps and create a lower profile for loading onto an airplane or checking your bag. Even the beefy hip belt will fit inside thanks to the stretchy material this cover is made of. And that flap is hidden right at the bottom of the bag, under a flap of Velcro—there when you need it, hidden when you don’t. Our major gripe with this system is that the strap management is less-than-optimal. 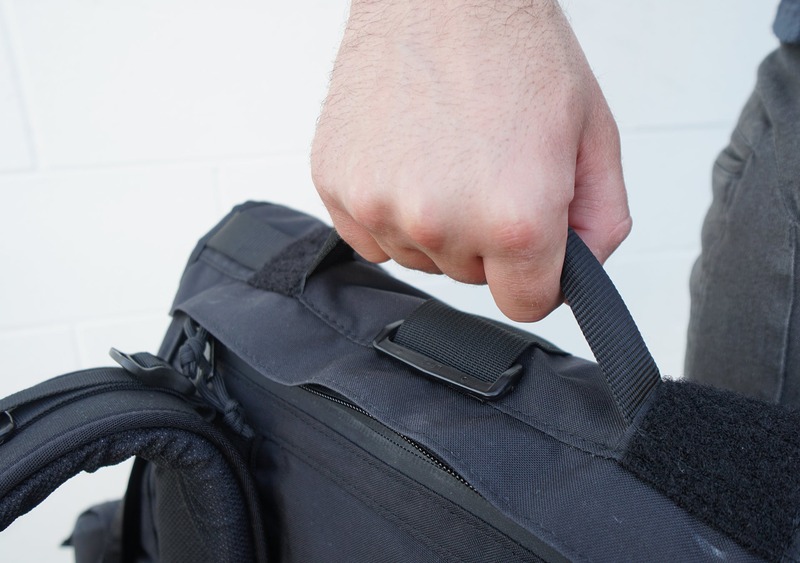 The load lifters have two Velcro strap keepers, allowing you to manage the straps a bit, but the hip belt and shoulder strap adjusters have no such thing. And even with respect to those Velcro strap keepers…they’re not the greatest. Most definitely not a #danglefreeexperience, which is disappointing. Granted, this is a minor nitpick with an otherwise incredibly comfortable harness system. Moving on to the top of the pack, there is a nicely padded grab handle that is comfortable to pick up even when the bag is fully loaded out. However, the foam inside is slightly asymmetrical, which is…weird. We’re not going to get super hung up on a slightly off-center strap, but it’s pretty annoying—especially on a bag at this price point. Why didn’t they just make it centered? Usually Mission Workshop’s attention to detail is pretty impeccable, so we were surprised to see this. Next to that handle are two MOLLE-like loops that can be used to attach additional items. We haven’t utilized these very much, to be honest. Moving on, it’s time to talk about the ARKIV system. As we mentioned in the beginning, ARKIV is Mission Workshop’s proprietary MOLLE-like system that is used for attaching various accessories to the pack. 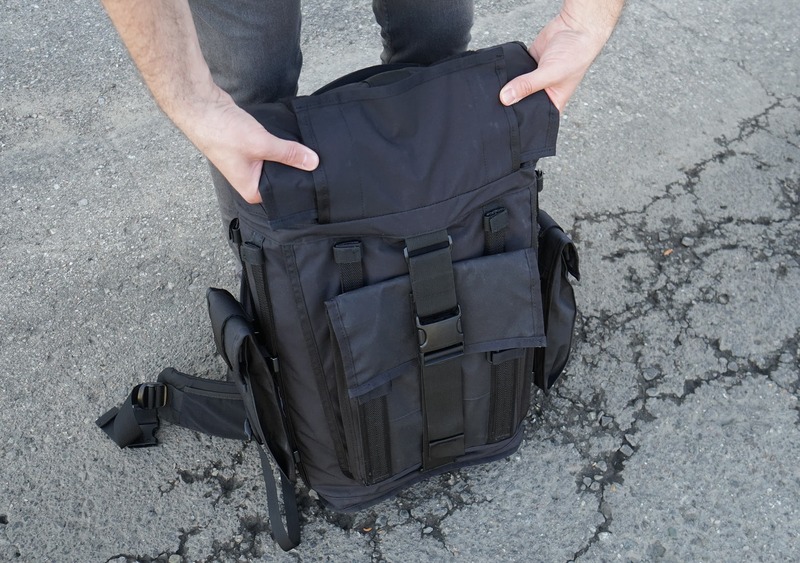 There are eight Arkiv rails on this bag, meaning you have four attachment points across the entire exterior. Keep in mind that these have different spacings, so specific ARKIV pockets will fit on specific areas of this pack depending on how they’re constructed. 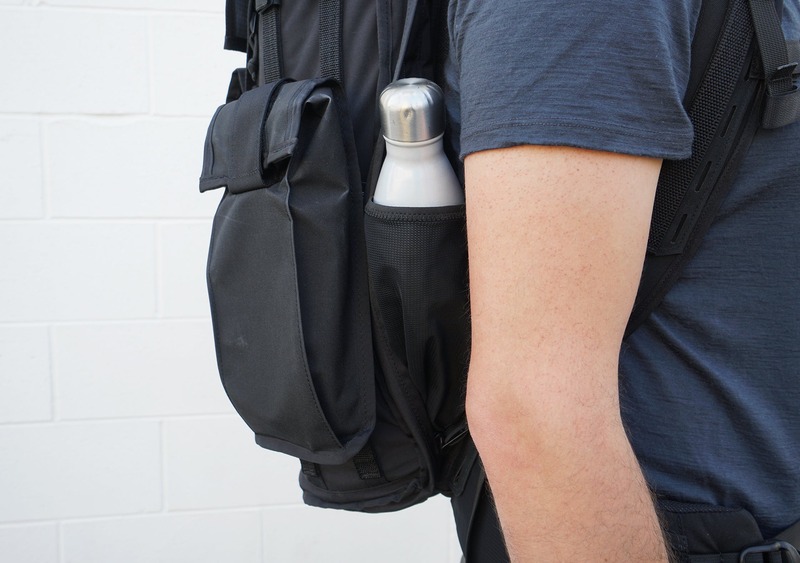 There are two vertical rolltop pockets that fit on each side of the pack. We found these to be perfect for keeping sandals or minimalistic shoes separate from the main liter capacity of your pack, as well as small water bottles. On the front is the ARKIV folio, which is good for flatter items. There are also two more ARKIV rails here, to attach even more accessories. 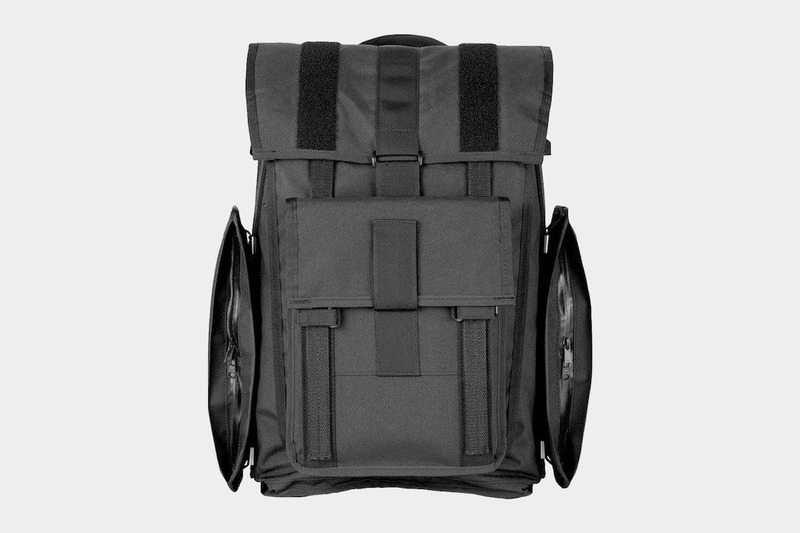 And lastly, there is a single rail on each one of the backpack straps, which is ideal for Mission Workshop’s cell phone pocket cases. Now, the question you’re all wondering is… Do I actually need all this customization? 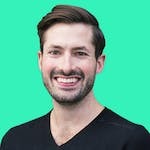 At the end of the day, it’s totally up to you and heavily dependent on what you’re carrying and what your organization style is. We can’t really make a call for you, but we can warn you that the more pockets you add, the further away you get from carry-on compliance. These additional accessories add a lot of bulk to an already-bulky pack, and it might interfere with your air travels. You might want to try the pack for a little while sans accessories and then decide whether you need some more functionality/space or not. And rounding out the external components, on the wearer’s right-hand side there is a hidden water bottle pocket which expands with some stretchy mesh. However, it can get a little bit awkward due to the positioning. It doesn’t work terribly well with larger water bottles. 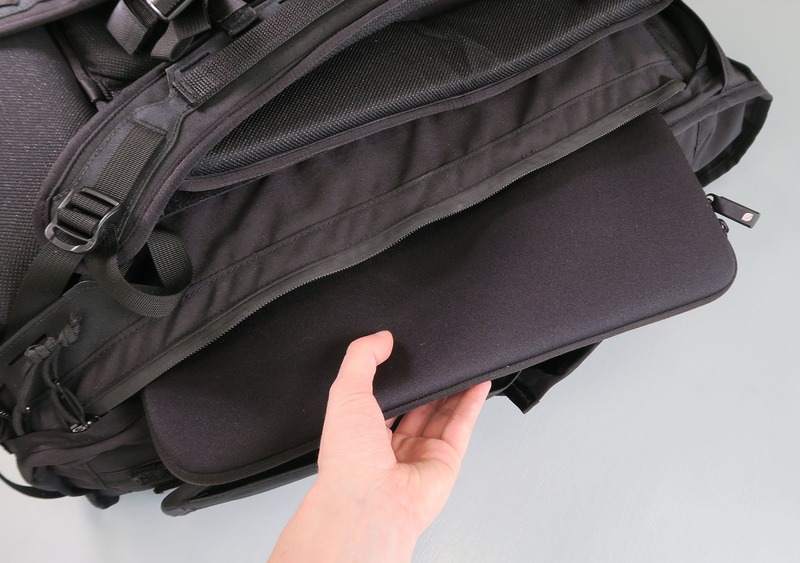 Starting towards the rear of the pack, there is an ample sized laptop compartment that easily fits a 15” MacBook Pro 15. You may even be able to fit a giant 17″ laptop inside—it’s seriously large. On the top of the pack, there is a quick access compartment that can be used for items that you want quick access to—like a tablet or water bladder. There’s a small clip loop that’s works as a toggle for your water bladder hose, and additionally, there are zippers on each side so you can control which side the hose comes out of. We should also note that all the zippers on this pack are durable, YKK water-resistant zips. We like both of these pockets, and we especially like how they have a hidden low profile underneath that side flap of fabric. But one small nitpick is that the zipper teeth for that strap hiding system are always exposed. This makes it a bit difficult to tell whether or not these pockets are open or closed. And lastly, the main compartment of the pack is accessible from the zippered flap on the front of the pack or the rolltop. There is a lot more to the rolltop than meets the eye, though. You can use it as a traditional rolltop or a panel loading top panel, which allows you to really utilize that space towards the top of the pack however you see fit. 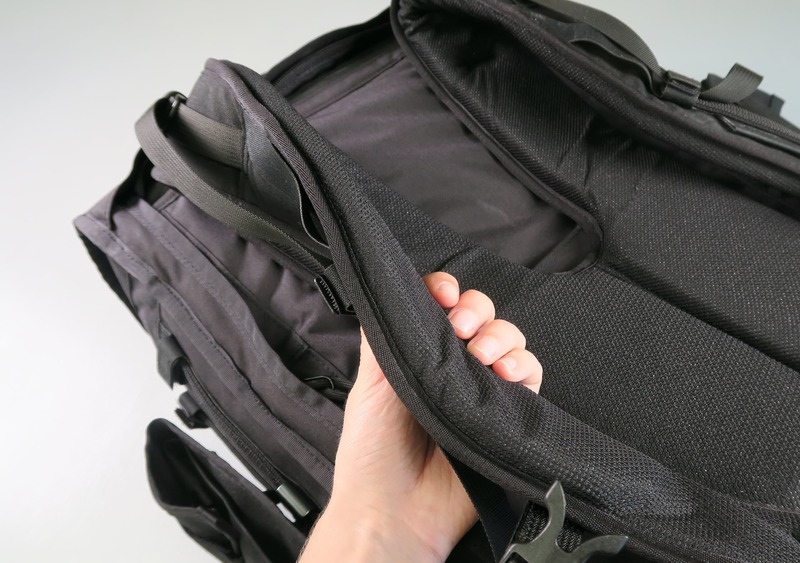 You can also use it with or without the Velcro and with or without the Duraflex strap—which you can then reposition on different parts of the pack, based on how compressed you want it to be. No matter how you roll, we’re confident you can find a way to configure this area to your liking. Yeah, we just made a rolltop pun. You’re welcome. One small note is that the Velcro access is quite loud. If you’re in a hostel and you don’t want to wake anyone up, you might want opt for the Duraflex top loading configuration. Alternatively, if you want to passive-aggressively disturb your hungover hostel mate who kept you up all night, this could be a welcome addition to your morning routine. Your mileage may vary. The main compartment of this pack is more or less a giant bucket, which we’re not mad about. 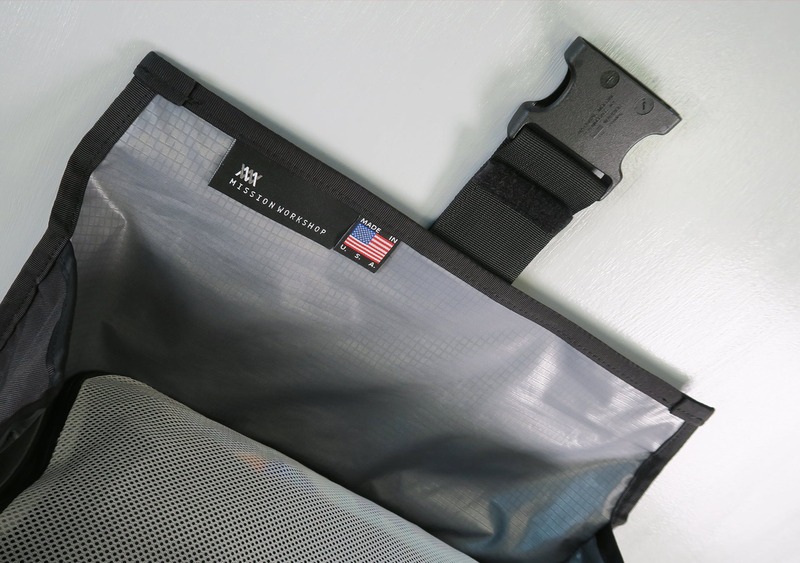 Each side has one stretchy mesh pocket that is made from a similar material to the water bottle pocket, and each one has a MOLLE-like loop for additional attachment options. There is also a large, stretchy mesh compartment on the top flap. 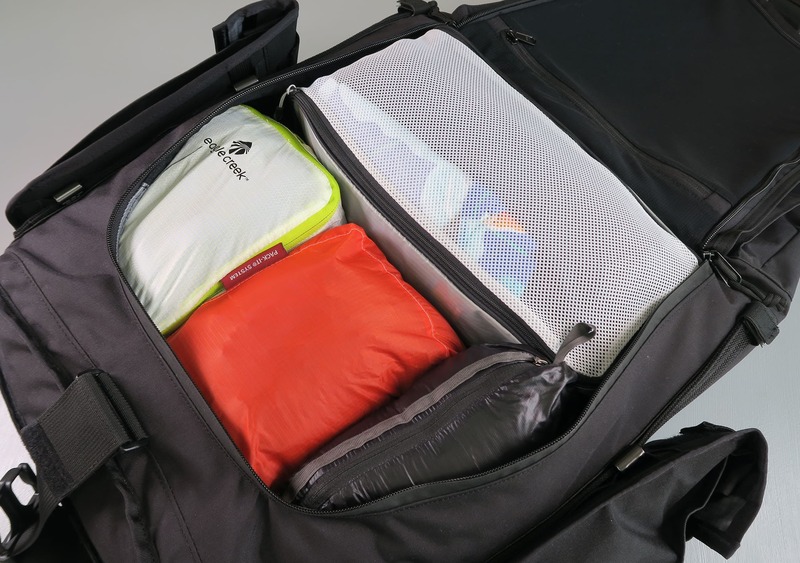 We always recommend using packing cubes with a configuration like this as it just helps keep everything well organized. From an access perspective, we’ve found it helpful to put items that you need quick access to towards the top—so you can just grab them from the rolltop—and put things like clothes towards the bottom. You’re not going to need to access those as frequently, and when you do you can just use the zippered flap. 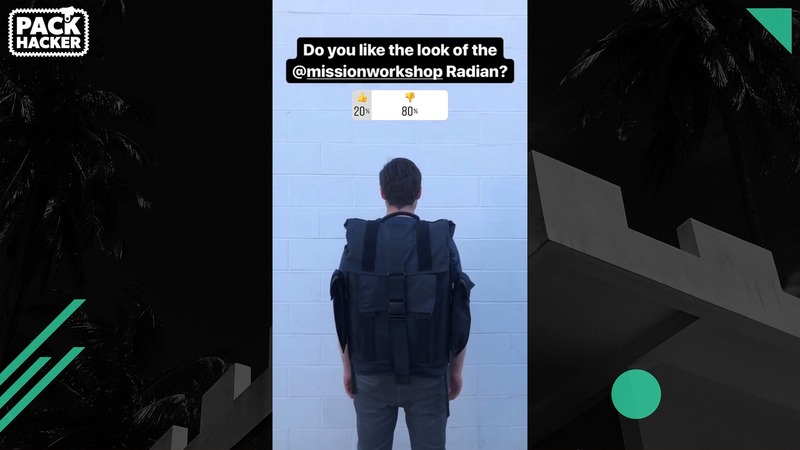 At the time of this review, we’ve been testing the Mission Workshop Radian for about two weeks in Detroit, upstate New York, and New York City. In actual usage, we found we could comfortably carry this thing fully loaded out, in its heaviest state, for long periods of time—whether it was on a hike or just getting to and from the airport. It did feel a bit cumbersome in crowded areas, due to the wider carry, and it is somewhat bulky on an airplane. It doesn’t fit underneath the seats very well—especially if you have those ARKIV pouches attached to the side—but it does fit into the overhead bin like a dream. And even then, it’s still a lot better and more compact than a lot of roller luggage available on the market. As far as durability goes, there have been no issues with this pack so far. Not even a loose thread within the two weeks of everyday testing. And that doesn’t really come as a surprise. 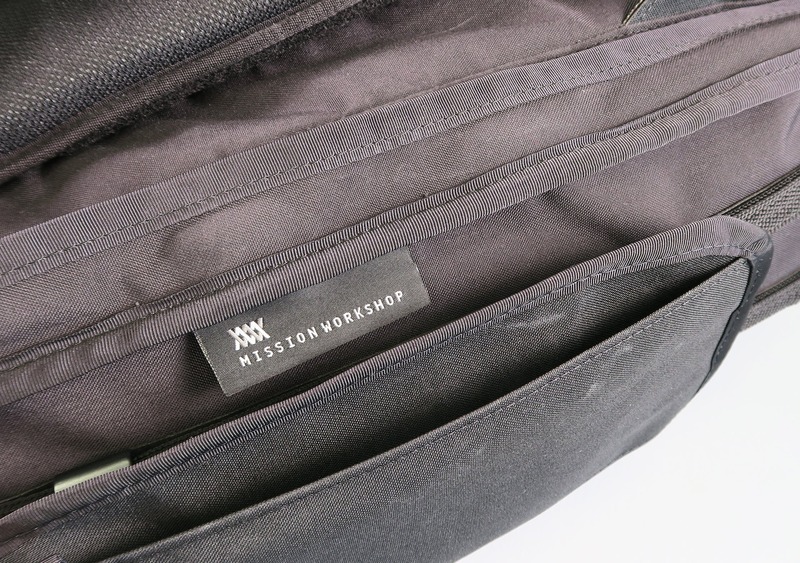 Mission Workshop makes some of the most durable packs out there and they use some of the highest quality materials available. You can stay tuned for additional durability notes on the usage timeline below, but we’re assuming this will follow the same path as the Mission Workshop Fitzroy, which we’ve tested previously and had little to no problems with. Mission Workshop also has their Guaranteed Forever warranty, which actually works. These are made in small batches in the US. and they really pride themselves on the gear that they create. At least from our testing, that is definitely reflected in their bags. This thing is wide, but also SUPER comfortable to carry. Still looking great, which comes as no surprise. This thing is built to last! 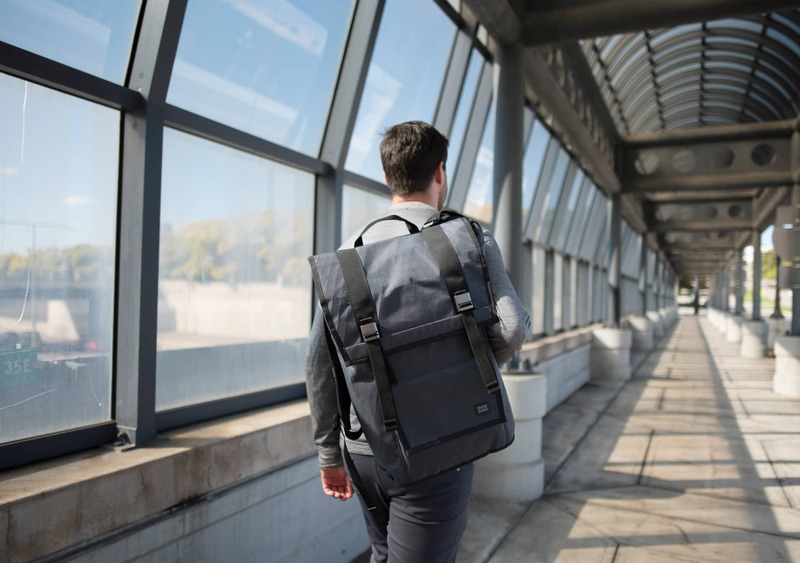 The Mission Workshop Radian offers a comfortable carry, high quality construction, and a lot of smart, modular thinking. If you’re into bags, it’s easy to geek out about all the quality design and features throughout this bag. 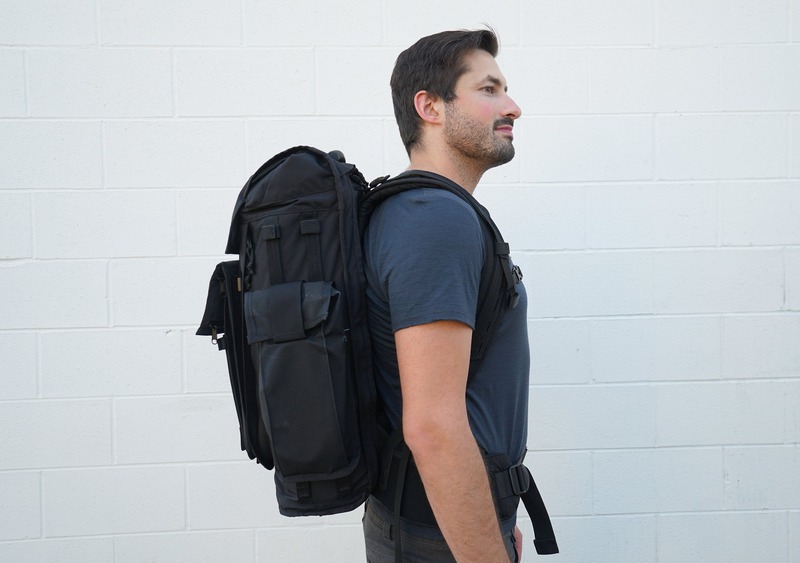 In practice, this pack is a tad bulky and heavy to use in the context of air travel, but if you’re conscious of the ARKIV accessories, as well as how you pack it, it’s one of the most comfortable, adjustable carries we’ve used to date.